The totals square footage per unit is the same at 1,594 sq. ft. each (total 3,188 sq. ft.) and it is split into 915 sq. ft. per unit upstairs and 679 sq. ft. per unit downstairs. There are two garages (1 each) that measur 11’1” x 20’ x 9’8” high, the front stoops measure 8’8” wide x 4’5” deep and the terrasse in back (off of the kitchen) is 16’ wide x 8’ deep for each unit. 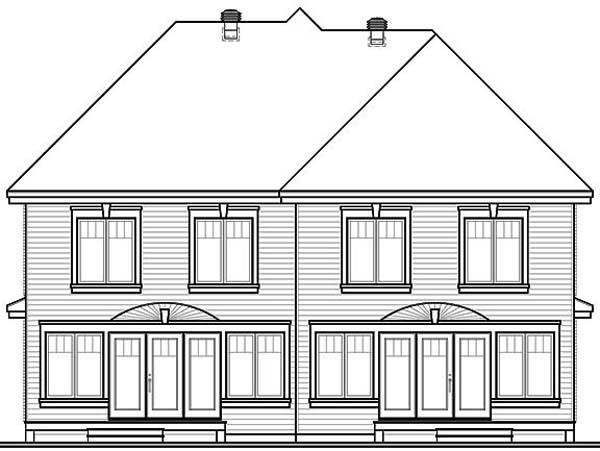 Answer: This plan could be suitable for a hill property. However, it might require a few modifications depending on the orientation of the lot. Please visit the Modification tab for more details. Question: what is the material of walls? Answer: The siding on the exterior walls is brick to the front elevation and horizontal vinyl siding to the other elevations. Question: whats the total sq ft. on the whold building? and whats the size of the lundry room? could that be a second bathroom. 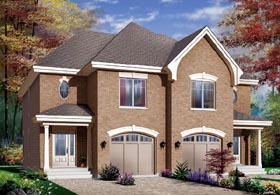 Answer: The total square footage for this plan is 3,452 including the garages. Laundry room is 7'-6" x 5'-6", so it can be modified to a small bathroom or a half-bathroom. Question: I was hoping to get the dimensions of the laundry room and main bath upstairs please. Answer: The bathroom is 8'-5" x 12'-8". The laundry room is 7'-6" x 5'-6".